Europe Sports Nutrition Market is expected to garner $10,429 Million, By 2021. The sports nutrition market in Europe has witnessed healthy growth rates in the past few years, and is expected to continue this trend in the future. Growth in health concerns, higher obesity prevalence, and rise in health clubs & fitness centers in Europe have led to increased demand for sports nutrition products. 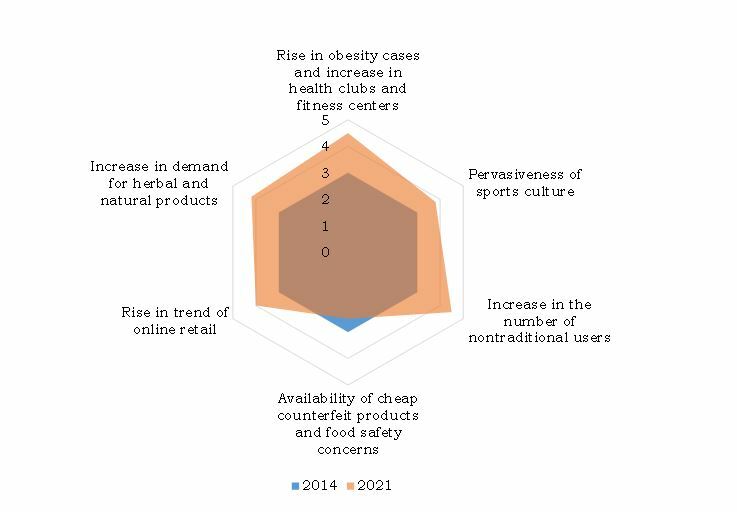 In addition, the inclination of people towards sports in the European region and rise in consumption of sports nutrition products by non-traditional users drive the market growth. However, availability of low-quality and counterfeit products restrain the growth of the market. Increase in demand for herbal and natural products are expected to offer opportunities for growth. UK and Germany are among the largest sports nutrition markets in Europe. Factors such as rise in interest of women to keep their body fit and toned, coupled with consumers upgradation to better and expensive sport nutrition products have further boosted the market growth. 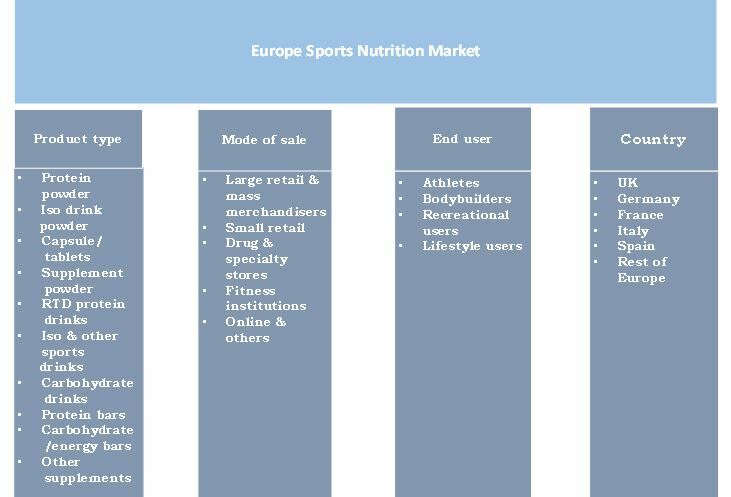 The report covers the study of the Europe sports nutrition market based on product type,end user, distribution channel, and country. On the basis of product type, it is segmented into protein powder, Iso drink powder, capsule/tablets (creatine, BCAA, and others), supplement powder, RTD protein drinks, Iso & other sports drinks, carbohydrate drinks, protein bars, carbohydrate/energy bars, and other supplements. Iso & other sports drinks generated the maximum sales in Europe. These drinks help restore the electrolyte balance and the hydration levels of the body. Carbohydrate/energy bars have higher penetration in Western European countries over Eastern Europe on account of their greater adoption as a premium lifestyle food. Increased adoption of such products in Western Europe is expected to provide impetus to growth in the future. Moreover, rise in popularity of such products in Eastern European countries due to increase in disposable income and innovative product launches are expected to supplement the market growth. Athletes and recreational users together accounted for a majority share of the European sports nutrition market. Mass marketing strategies adopted by players and growth in sales through online retail channels have fueled the sales of these products. 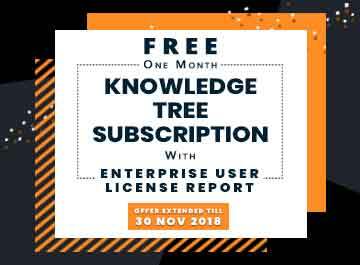 New product launches catering to the need of non-traditional users coupled with their increase in health awareness and rise in income levels are anticipated to foster the market growth. Product launch is the key strategy, adopted by some of the major players such as, The Coca-Cola Company, Maxinutrition Ltd. (GlaxoSmithKline PLC), Science in Sports Plc, and Atlantic Multipower Germany GmbH and Co. OHG (Atlantic Grupa D.D.). Companies have launched new products or expanded their existing product line to cater to the market needs and increase their customer base. For Instance, Nutrend expanded its product portfolio with the launch of a new dietary supplement, Diet Protein. The product is intended for men as well as women, and is a suitable replacement for the regular diet. In 2014, Maxinutrition revealed the worlds first creatine milk. 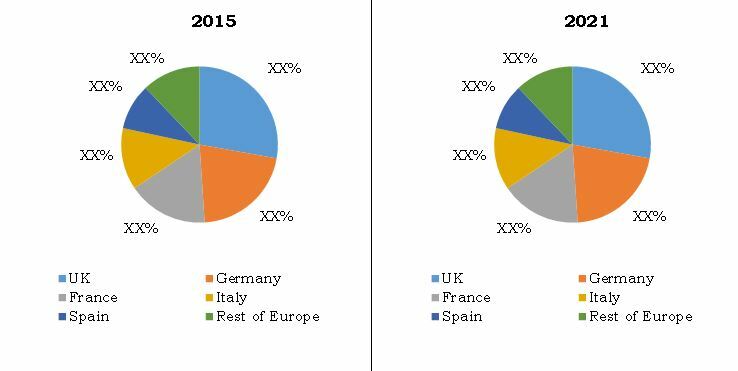 UK, Germany and France are the prominent European markets compared to Italy, Spain and rest of Europe. These countries are expected to maintain their dominance and witness higher growth rates throughout the forecast period. Collectively, they accounted for over 60% of the total market revenue in 2015. Penetration of Iso & other sports drinks and protein powders is higher in Italy, Spain and rest of Europe. Carbohydrate/energy bars and protein bars are expected to gain rapid adoption in the entire European region. The French sports nutrition market has grown at a notable pace and the adoption of sports nutrition products has been on a rise in the country over past few years. Protein products are gaining popularity over sports drinks and other products among the French consumers. Ingredients that are commonly incorporated in such products include creatine, L-carnitine, amino acids, and glutamine. Among protein-based products, protein powders are more prevalent over bars and other ready-to-drink protein products. EA Pharma is amongst the reputed sports nutrition companies in France, offering a wide range of sports nutrition products. Best-selling brands of the company in France include Eafit and Supragen. Rise in obesity and increase in the number of new health clubs and fitness centers have fueled the consumption of sports nutrition products in the European market. As per the Central Intelligence Agency (CIA) statistics, in 2008, the prevalence rate of obesity was reported to be 26.9% in the UK, 25.1% in Germany, 26.6% in Spain, and 19.8% in Italy. According to industry sources, in 2015, over 13.0% of the UK’s population were registered as members of private health and fitness clubs. Hence, increasing obesity and the growing number of new fitness facilities are expected to boost the demand for these products in Europe. Pervasiveness of sports culture in Europe has boosted the European sports nutrition market. Several athletic games are conducted in Europe such as Royal Ascot and Epsom Derby in horse racing, Tour de France, and Giro ditalia in cycling, world touring car championship, and others. In addition, weightlifting games are held at Olympics, Russian, and European championships. Increase in the number of sports events and growth in popularity of sports nutrition products among athletes and bodybuilders are expected to fuel the growth of the European sports nutrition market. Increase in health consciousness among recreational and lifestyle users has fueled the sales of sports nutrition products. Changes in lifestyle and increased awareness regarding the benefits of such products have led to an upsurge in the usage of these products by working women for weight management, on-the-go business people, and youth population. Thus, increase in number of nontraditional users is expected to fuel the market growth. Sports nutrition product manufacturers face challenges due to the availability of cheap counterfeit products in the market. Usage of these products is associated with health problems such as, liver damage due to the consumption of protein supplements. Some of these products contain amphetamine-like compounds and unsafe levels of lead, cadmium, arsenic, and mercury, which cause severe health effects. Easy availability of counterfeit products on online platforms is expected to hamper the market growth. Key market players profiled in the report are Glanbia PLC, The Coca-Cola Company, Atlantic Multipower Germany GmbH and Co. OHG (Atlantic Grupa D.D. ), Maxinutrition Ltd. (GlaxoSmithKline PLC), Olimp laboratories Sp. Zoo, Nutrend D.S.,a.s., Ultimate Nutrition Inc., PowerBar Europe GmbH, Science in Sports Plc., and PacificHealth Laboratories Inc.
Other players in the value chain include PepsiCo Inc., Reckitt Benckiser Group Plc., Clif Bar & Company, Abbott Nutrition Inc., and Otsuka Pharmaceutical Co. Ltd. The report includes extensive analysis of the factors that drive as well as restrain the Europe sports nutrition market. The market projections for the period 2016 - 2021 is included along with factors affecting the same. The market is segmented on the basis of product type, end user, distribution channel, and country.